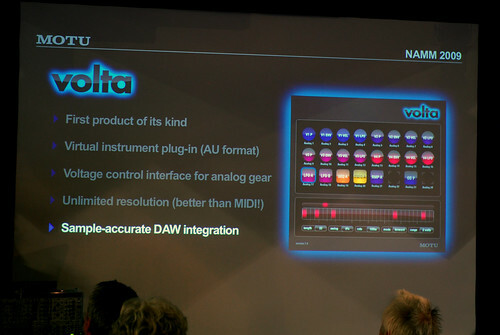 MOTU was showing off something that absolutely blew my mind this morning: Volta. It’s a plug-in intended for use with any of their DC-capable audio interfaces (Like, say, a Traveller or 828), it allows multi-channel PitchCV/Gate/ControlCV out to your modular system. Its interface is like a grid for your IO, each output is a box in the grid. Into the grid, you place (drag and drop-style) the voltage source for that output. You may choose from items as mundane as the channel’s midi input (for things like note data), or as crazy as step/trigger sequencers, LFOs, clock sources, etc. There’s a built-in calibration and scaling tool, so that it can automatically determine the proper CV scale to generate musical pitches from your possibly-less-than-perfect analog oscillators. They couldn’t quote an exact price, but they said to expect in the $250 range. Of course there is the cost of a MOTU audio interface if you don’t already have one. That said, killer product for analog geeks like me, way to go MOTU, I know this must have been a hard one to pitch to management.